This page provides help and instructions on how to troubleshoot and configure the Autoscheduler / Artificial Intelligence (AI) part of the Crowd. Assuming the previous steps were completed successfully, it should now be possible to see the crowd widget on Workforce Management app. HARD The constraint is necessary for a solution. A solutions is found if and only if it does not break the constraint. SOFT The autoscheduler will do a best effort to minimize the constraint, but solutions can be found, even if they break the constraint. The order of constraints is important. Constraints on top of the list will have more weight. Earliest plan SOFT With all the conditions being the same, the Autoscheduler will try to plan the activity as early as possible. The address of the technician is taken from the Person of type ‘EMPLOYEE’, which is synchronized with the UnifiedPerson. The address taken is of type HOME. If this address is not present, the WORK address is taken. When no address of type HOME or WORK is present, the technician is not taken into consideration for autoscheduling. The activity address is taken from the Equipment, Business Partner or Service Call (in this order). Both addresses should be geocoded. When the address originates from the ERP it may take some time to geocode it in the cloud. Sometimes up to hours. In the WFM, the service call and activity do not have a field for storing the duration explicitely. The duration is the calculated difference between end and start time. In the example on the right there is an activity with a duration of one hour. The duration will never change, even after several planning and re-planing events. When real-time mode is enabled, the location of the technician is taken into consideration for the current moment. The driving time will be computed based on the current location of the technician. Prior to the use of this feature, the mobile auto-location must be activated. There are two settings which influence the behaviour of real time location of technician. 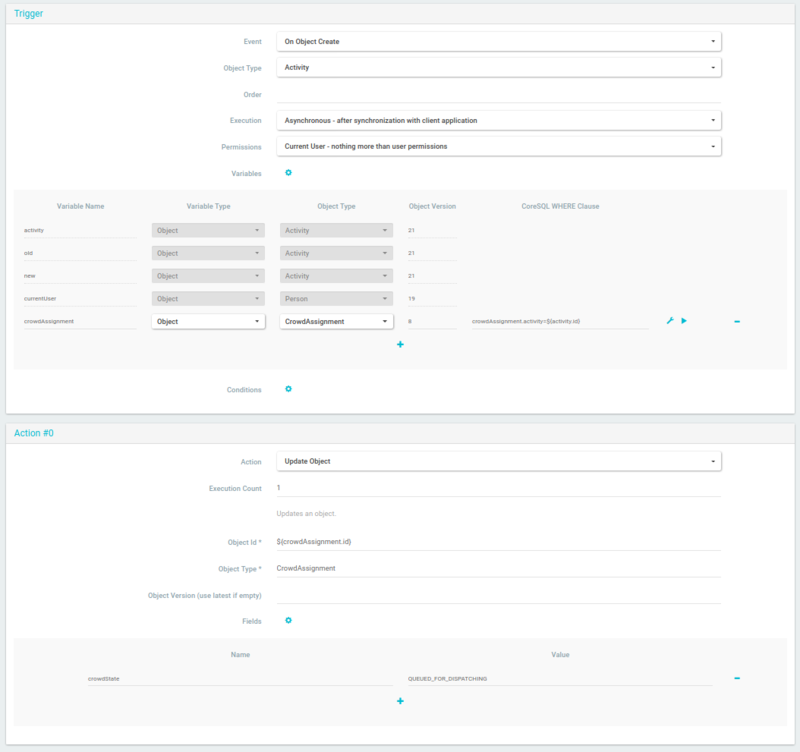 Enable Real-time Causes autoscheduler to use the real-time. Otherwise, the home or work location will be used. 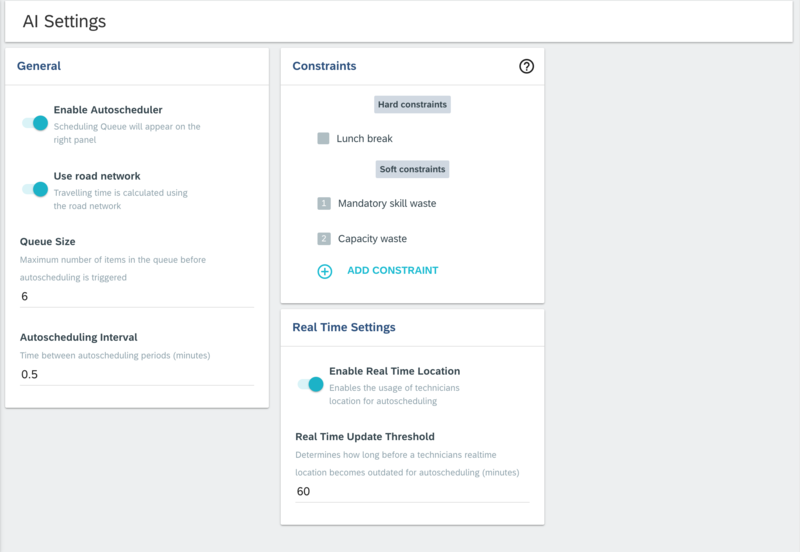 Real-time Update Threshold Determines how old the last location update can be in order to be taken into account for scheduling. 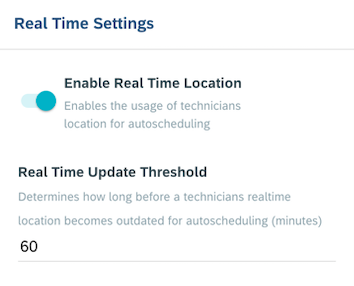 If the threshold is configured to five minutes, a location update from ten minutes ago would not be taken into account, but the home address and the address of the technician’s currently assigned job will be used for scheduling calculations. Timeliness is calculated as follows: last update is after or equal to current moment of scheduling minus threshold in minutes. The driving time is computed using the road network–when in road netork mode– and considers the speed in of the particular road. If the road network mode is not enabled in the settings, a speed of 30 Km/h in straight line will be considered. All the times are in minutes. The Autoscheduling Widget will display on the right-hand side of the Dispatching Board application. Scheduling follows an asynchronous workflow, in which jobs are added to the queue for later dispatching. Jobs can be added by dragging and dropping them onto the Autoscheduling Widget, or through selecting them from the Activity List and clicking the Add to Queue option. Alternatively, a business rule can be created to automatically add activities to the queue (see FAQ below). In the AI settings interface, the queue size threshold and timeout can be set in the AI settings screen. Q: Can we plan for internal technicians only? Remove all the technicians from the service provider. This can be achieved by setting “plannable resource” to false in the Person. Q: Crowd is not finding technicians, but I know there is a technician living nearby with all the skills. A: A possible and common reason is the lack of address or it not being correctly saved due to the Person and UnifiedPerson syncronization bug. Q: Is it possible to have all new activities go directly to the queue? Note: this business rule does not update search, which impairs the visibility of the process. The activity will not appear in the crowd queue widget. But it will be crowded nevertheless. 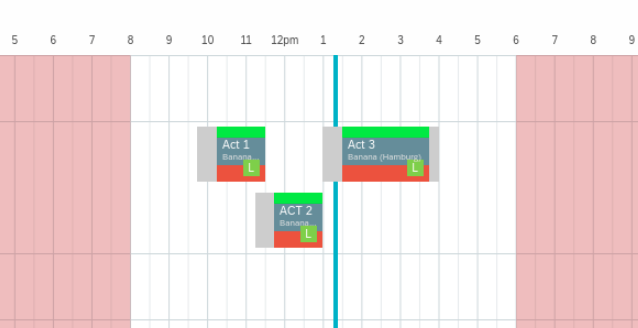 Q: When I autoschedule activities, the result overlaps, like in the picture. A: Due to visual generalization, non-overlapping tasks seem to overlap in the planning board. The activities are not temporally overlapping at data level. This will be fixed in a future release. Q: Activity cannot be added to the queue. Drag and drop does not work, nor does selection from planning list. Why is this behaviuor happening? A: The autoscheduling only works with activities, not with service calls. Activity needs to be created beforehand.